I’ve been a bit slow to take up Twitter (had been warned it was full of people telling the world what was in their sandwich or stuck to their shoe) but after a few months I’m learning the value and interest to the point where I’ve just indulged/invested/wasted (delete as your ethos sees fit) a morning checking out links from tweets by people I now follow – see below for a selection – and then extended the trail beyond that which has taken me to some very immersive terrain about past and future technologies. 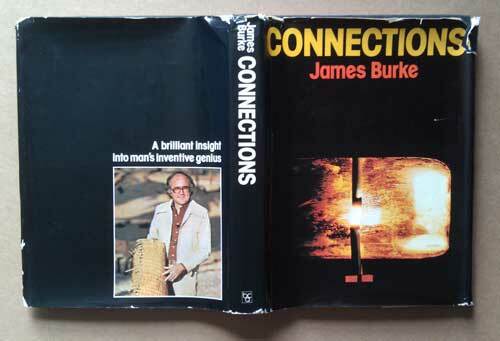 This trail led to a rediscovery of the 1970s TV Connections series by James Burke. I’d often thought I was a out on a geeky limb in believing that this introduced a revolutionary, and for me exciting way of looking at history / science. Pleased to find a copy of the ‘book of the series’ tucked away on a shelf at home! Maybe, if you’re a scientist, there’s some spurious short cuts or unsupported leaps in there – I wouldn’t know but I remember being totally astonished by the sequence in one episode where Burke explains how the C14th Black Death led to the invention of the computer via changes in technology to weaving and paper-making, the invention of moveable type and later punch cards for jacquard loom weaving – with some other interesting diversions en-route to the Cistercians and carillons. These connections have stuck with me for over 30 years because, I think, they offered what was then such a vibrant way of perceiving the relatedness of objects, people, places, and ideas in rich contexts, and this provided me with some kind of tool of enquiry, or lens for focusing information that I hadn’t possessed before. It made a real impact on me at the time and I’m pleased to find now that others admire him too. This entry was posted in Ways of looking and tagged Connections, James Burke, technology, twitter. Bookmark the permalink. ← It’s Electric December time – a personal reflection and celebration!